A Systems Approach to Ceiling, Walls and Interiors. Our dynamic, aggressive team, backed by years of solid experience in commercial, institutional, single family, and multi-family residential projects, is ready to serve you. From our skilled tradesmen to our project management staff to our award winning customer service department, each team member works closely together to provide creative, cost-effective solutions to customer needs. This team concept, which is the driving force behind our operating philosophy, assures you of receiving the highest quality finished product, on-time and within budget. To further ensure the superior workmanship for which Wal-Tec has become known, we use only the best brand names - including USG, National Gypsum and Georgia Pacific. Wal-Tec's tradition of value-engineering excellence, backed by years of stability, makes it the Interiors Company of choice in the greater Metro Detroit area. 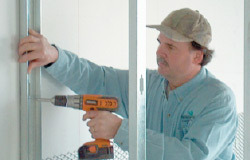 So, if you're serious about innovative yet cost-effective ceilings, drywall, or partitions, contact us today. We have a system that's right for you! We can even provide General Contract services! Here's what some of our many customers have said about us.